Meet Baby- a heroic little Frenchie Bulldog living in Berlin who ‘adopted’ motherless wild boar piglets! Batpig & Me are in awe! Six wild boar piglets have found a new friend in a maternal French bulldog named Baby. The piglets were brought into the Lehnitz animal sanctuary outside Berlin on Saturday, three days old and shivering from cold. Baby ran over and snuggled up to them, keeping them warm, even though they were almost her size, said a sanctuary worker, Norbert Damm. The eight-year-old bulldog has stayed by their side since then. “She thinks they’re her own babies,” Damm said. It is not the first time Baby has taken to new guests at the sanctuary – she has also raised raccoons, cats and many other animals. “She’s an uber-mother,” Damm said. The piglets’ own mother was probably killed by a hunter, and the litter of three males and three females was found abandoned in a forest. They weighed less than a kilogram each, but are being bottle-fed at the sanctuary and are growing well, Damm said. He said they could not be released into the wild because they had no fear of humans, but it should be possible to set them free in a nature reserve in about three months, once they can feed themselves. Wild boar are common in Germany, even in big cities, and herds have been growing as expanding commercial crops have provided them with more food. Recent estimates have put the boar population at more than 10,000 in Berlin alone, where they live in extensive wooded areas and often venture into backyards and sports fields, tearing up turf to look for food. 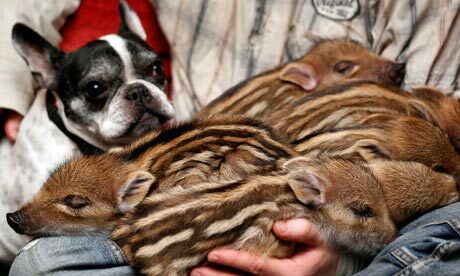 via French bulldog called Baby adopts six wild boar piglets | World news | The Guardian. A special thanks to our Facebook Frenchie pal Étienne Moolman for sharing this article with us!